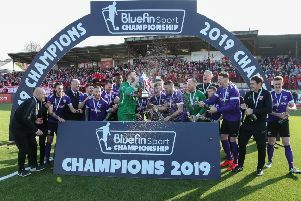 Larne have confirmed the capture of three summer signings as part of the ambitious Bluefin Sport Championship club’s push for continued progress. The Inver Park outfit used the official kit launch to reveal the latest additions to the Larne panel. Defender Ben Tilney is on board from MK Dons, with a graduate of the latter club - Andrew Osei Bonsu - signed from Dunstable Town to bolster the midfield options. Liam Hassin, who enjoyed a promising campaign at Carrick Rangers, has returned to the club.